Do you think economic growth (+1) or CO2 reduction (+5) is more important for the world? against Dutch state. On 2018/10/09 again! point for point you think this can't be true. And yes, it happens again. a hefty slap on the wrist by a judge. against the emissions of CO2. by a judge in the appeal of the climate case. with at least 25% by the end of 2020.
and it couldn't have gone better. We were proved right on all points. I'm very happy, I'm very proud. both legally and with respect to the content. already aware of the severity of the climate problem. actually pursued a target of thirty percent reduction. on what other countries are doing. not exempt the Netherlands of its own duty of care. for 2030, in twelve years time, is rejected. 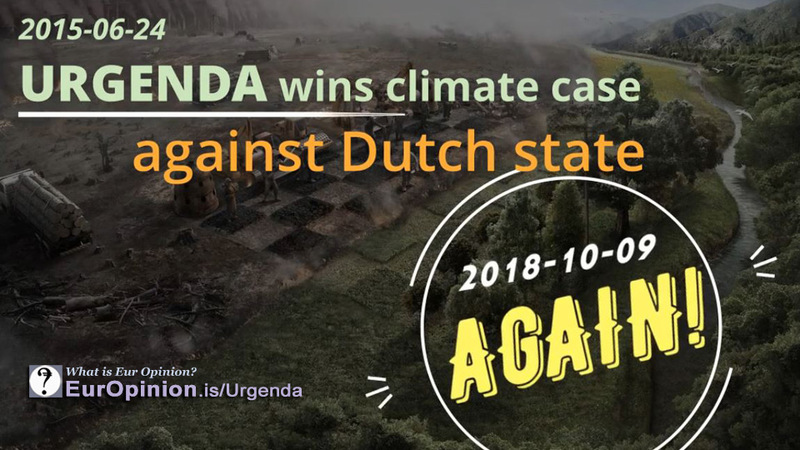 On 24 June 2015 Urgenda foundation together with 900 other claimants won a lawsuit against the Dutch State about national climate policy. Through the court, it was enforced that the Dutch State must have reduced greenhouse gas emissions by at least 25% by the end of 2020, compared to 1990 levels. The appeal lodged by the Dutch government was rejected on 9 October 2018, but the government announced on 16 November that the Dutch state was going to appeal to the Supreme Court.